There was a story floating around last year that a Chipotle was opening in Latham. But months passed and nothing happened. It seemed like the Capital Region would continue to be burrito bol-less. Then we saw Ellie's comment today about a Chipotle in Wilton. So we called up Chipotle and talked with Chris Arnold, a spokesman for the company. He confirmed that the fast-casual Mexican chain is planning to open three restaurants in the Capital Region this year. The first location scheduled to open will be in Wilton on Rt 50 in the same plaza as the Five Guys that just opened. Arnold says the location is slated to open in late April or early May. A job posting for the location sets the date for April 24. 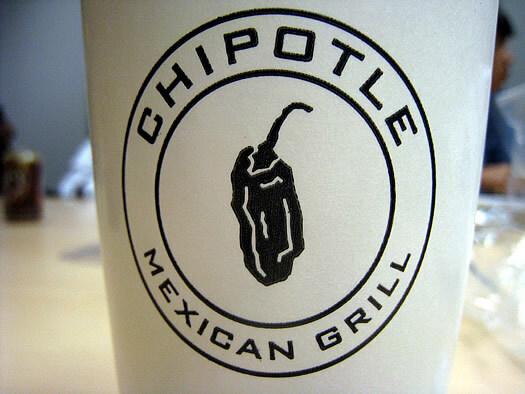 The Wilton Chipotle will be the chain's first location in Upstate New York. Arnold says they're also looking to open locations in Rochester. We gotta say we're looking forward to the arrival of Chipotle. The food is good -- and it seems like the company makes an effort to not be evil. The company does sound good. Does anyone know how it compares to Baja Fresh? Been to those and thought the food was pretty good. Speaking of burritos... anybody know whatever happened to Bombers plans to open a franchise in Schenectady? Ellen: I've never been to Baja Fresh but I love chiplotle's burritos. The food is very good quality considering it's fast food. Well thank GOD. For a second there, I thought the rampant morphing of the Capital Region into a sea of big-box stores and corporate cafeterias was going to stop because of the recession. Seriously, I don't care how good the food is... it makes me very sad that the ratio of franchises to unique local restaurants is so grossly off here. Get out the fat pants! Chipotle's so good! @Ellen: Personally, I like it better than Baja Fresh (though Baja's good,too). Chipotle doesn't have as big a variety of pre-fab menu items (it's more like Moe's "conveyor" system: pick an item, pick your meat, and pick the toppings), but I feel like the food's more substantial and of a better quality--their portions are bigger, too. One thing that I think could use improvement is their salsa situation-- Chipotle doesn't have the great salsa bar like Baja or Moe's. Typically we'll bring our burritos home and load up on salsa there. I've eaten at a Chipotle once and I thought it was much better than Baja Fresh, which I've also only had once. I have to say I was very excited by the headline only to be greatly disappointed by the actual locations. Wilton, Latham and Clifton Park do me no good living in the city of Albany. Guess I'll have to stick with Bombers and Moe's, eh. Wow - just ate at both Chipotle and Baja Fresh just last week in sunny California and was amazed at the freshness of the food. The Fish tacos at Baja were terrific and the pork and steak tacos at Chipotle were really tasty. And I am definately not a chain kind of girl. Was so impressed I even took photos! For those who may not know, Chipotle started the upscale fast-food Mexican craze... Moe's, Qdoba, Baja Fresh, Salsaritas, etc are all cheap knockoffs of the concept. I guarantee that Moe's in particular will be completely unpalatable once you've tried Chipotle. okay, I pride myself on being an indie restaurant snob so I'm embarassed at how EXCITED I was when I saw this posting...got hooked on Chipotle many years ago visiting sis in Colorado and don't know if they are still owned by (sigh) McDonalds but I just.don't.care. Fresh, delicious, made right in front of you. yay! Chipotle is no longer owned by McDonald's at all. Does anyone else--I guess I can only include state workers in this question--remember the short-lived Sandella's next to the McDonald's on the Empire State Plaza concourse? They were owned by the McD's franchise owner, and specialized in doing various things with flatbreads. Most of them affronts to culinary taste. HIP HIP HOORAY! Chipotle is fresh and delicious! There is a sign in the new Price Chopper Plaza in Wilton right by the mall...and I cannot wait for them to open. The guac and corn salsa are just delish!!! Cannot wait! Why are people here so freeking obsessed with chain restaurants and stores? Bombers is good... can't wait for Chipoltle to join the army of burrito chains coming to this area to put them out of business. We have a great food co-op... but we NEED a Trader Joe's to put them out of business... I'm going to start a petition and dedicate my life to bringing that chain here! I work in Wilton so when I was grabbing some fries at Five Guys, I saw the Chipotle sign. Let's just say that these two restaurants have already signed my bank account's death sentence. Bombers? Really? When you get a cockroach in your burrito, let me know how you feel. I will forever only order the wings there, and still I inspect very carefully. It's a great place to drink, but not the best place for food. I'm not terribly excited to see a Chipotle here, but any business is good business at this point. Yeah, I'd rather it be local business, but if you want to support local Mexican eateries check out Aztecas. I have eaten at all the above chain places and Chipotle is my choice too. simple, fast, fresh, and good. high calories!! oh me oh my, its just the way things are today. its not just here, in fact, when i first moved here a year ago, I was impressed with how many local places there are in SMALbany. I think you're pretty fortunate. Im mean you don't have a WholeFoods or anything so I think you're safe for now. bombers is not good, The place is run like crap and its usually pretty dirty. no way does it compare. chipotle is very clean, and they hire illegals! It's great and all to support local businesses, but if they're sub-par, why bother? At least with Chipotle, I've always had a good experience. Have never been to a Baja Fresh, but have visited Chipotle in California and they're considerably superior to Moe's. Moe's has a good selection of salsa's, but the burritos are tasteless. Nothing any of the three put out can compare to the hot sauce at Aztec's - WOW. Ask for it as a dipping sauce. chipotle is pretty good. even thought they are not a franchise and company owned, the quality varies greatly. i have been to many: L.A., Atlanta, Chandler, NYC and a few more. as far as local, has anyone ever been to Burrito Joe's downtown. It;s right near blue 82. only open for lunch, but the burritos are awesome and the line moves pretty fast. as for bombers, they are not, never have been, and never will be any good at making burritos. but, i drink there all the time!! Chipotle may sell a good burrito but they are just another criminal business that hires illegals instead of citizens. With more than 20,000,000 citizens out of work and just as many iegals plus their offspring enjoying jobs once resrverd for Americans, every time we buy from a business like this we are helping to destroy the way of life we'vecome to know. If you don't think you've been hurt by illegal immigration, then you are either one of the few who is profitting by it or you just haven't been paying attention. So is there any information on when a Chipotle might be opening up here in Latham? Opens Fri, Nov 6, 2009. Chipotle knowingly hires illegal workers! And all of you that eat there, are supporting this company to get away with it. Shame on all of you. Shame on YOU for not telling me this before I ate there! God, the nerve of some people!